Transparency Market Research (TMR) (www.transparencymarketresearch.com) has published a new report titled, “Single-use Bioprocessing Systems Market - Global Industry Analysis, Size, Share, Growth, Trends, and Forecast, 2018–2026”. According to the report, the global single-use bioprocessing systems market was valued at US$ 2791.4 Mn in 2017 and is anticipated to expand at a CAGR of 11.4% from 2018 to 2026 to reach value of US$ 7,259.9 Mn in 2026. Growth of the pharmaceutical industry, rise in government initiatives, increase in health care expenditure, new product approvals, and growth in patient population are projected to augment the global market from 2018 to 2026. The single-use bioprocessing systems market has progressed from being in a nascent phase in the 1990s to a thriving market in the recent years due to rapid adoption and demand for single-use bioprocessing systems from large as well as small, niche biopharmaceutical companies. CROs and CMOs which have smaller facility design and operate under stringent deadlines for their customers are also expected to show significant demand for single-use systems during the forecast period. Demand for single-use bioprocessing systems, particularly bioprocessing bags, single-use filters, and bioreactors, has been driven by pressure to surmount competition as well as decrease the disease burden by bringing cheaper drugs to the market. Since single-use technologies can be installed easily in a period of 6-18 months and require low capital costs at the time of installation, the time needed to market critically important biologics, such as, vaccines and monoclonal antibodies used in the treatment of cancer and infectious diseases is significantly reduced, and so does the cost of producing the product. Such advantages are likely to boost the single-use bioprocessing systems market in regions such as Asia Pacific and Middle East & Africa, where there is a substantial population requiring treatment for autoimmune diseases and cancers at an affordable cost. Moreover, preventive needs such as vaccination are all the more crucial in developing countries, where the risk of getting affected by infectious diseases is higher compared to that in the developed world. Growth in aging population across the world is pushing the proportion of patients suffering from various infections and diseases. According to research findings by the World Health Organization (WHO) in 2016, the number of people aged 60 years and above will reach 2.5 billion approximately by the end of 2050. More than 25% of the world’s population will be over 65 years of age. Geriatric people are more prone to diseases such as hypertension, chronic kidney diseases, diabetes, cardiovascular diseases, cancer, etc., as their immunity becomes weak with growing age. Thus, it increases the demand for medical supply and services in biopharmaceuticals among patients. This, in turn, leads to the use of bioprocessing systems for better process efficiency and throughput. It also gives an edge over easy and better regulatory compliance process. Additionally, rise in outsourcing of manufacturing activities to CMOs, CROs, and CDMOs is set to propel the single-use bioprocessing industry, as increasing number of CMOs that have small flexible facilities are now beginning to rely on single-use equipment in their process value chain. As such, these factors help drive the global single use bioprocessing systems market. An important driver of the single-use bioprocessing systems market is the provision of customization that these systems provide to the customers. Bioreactors, bioprocess, single-use bags containers are all open to customer specific requirements, depending on the type of application. Precisely, these systems provide flexibility to the customer, which is not the case with capital equipment. Small or medium-sized manufacturers can buy and customize their products. For example, bags can be customized right from 50 ml to 2500 L in size. Thermo Fisher Scientific believes most of its business in North America is driven by custom requests within and around its plant location. Single-use filters are a highly useful purchase for bioprocessing operations as they aid in the most critical separation and purification step during downstream processing as well as filtration of debris and contaminants during upstream processing. Single-use tubing assemblies and other consumables, such as, connectors and clamps are crucial to link processes in the production chain, and thus, their market is anticipated to remain strong in line with the sale of bioprocessing equipment. 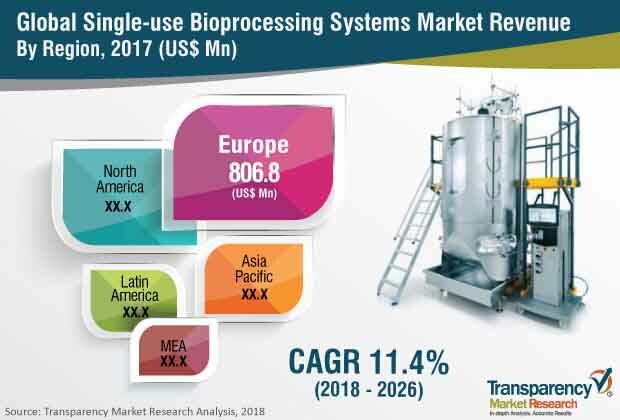 Overall the single-use bioprocessing systems market is projected to witness strong growth as it caters to a broad base of consumers — those willing to opt for hybrid bio-manufacturing facility set-ups (stainless steel & single-use) as well as for fully single-use facility set-ups. Moreover, presence of vendors with access to technological expertise is likely to further propel the growth of the market. Extractables are chemical species that migrate from packaging or container materials into the contents when exposed to certain solvents in exaggerated temperature and time conditions. Leachables are chemical species that make their way into the product under normal application conditions. It is imperative that single-use products are devoid of extractables and leachables as these have the potential to interact with a drug at multiple stages during development and production, which could impact efficacy, safety, and quality of the final product. Top manufacturers check such risks associated with extractables or leachables; however, these could still remain a potential risk, especially if purchased from local unregulated manufacturers. Single-use systems also have other technical limitations including, difficulty in scaling-up to large volumes and potential risk of puncture and tearing of the plastic under high-stress conditions. Thus, the aforementioned factors are anticipated to restrain the growth of the single-use bioprocessing systems market during the forecast period. Key companies profiled in the report include Merck KGaA (Merck Millipore), Thermo Fisher Scientific, Sartorius AG, Danaher Corporation (Pall Corporation), Eppendorf AG, GE Healthcare, PBS Biotech, Inc., Meissner Filtration Products, Inc., Finesse Solutions, Sentinel Process Solutions, and Saint-Gobain .